We are right on the beach in Waves , about a mile south of the Rodanthe pier. The views of the ocean are spectacular, and the pool and hot tub and white sand beach right in front make for lots of different things to do for fun. The short walk to the pier makes fishing easy and they let you take your dog onto the pier. There are two bedrooms on the second level next to the kitchen and dining room. Then there are two bedrooms on the top floor next to the great room. The fourth floor is a loft with a futon and 2 twin beds. Oh, and the waves are great right out in front of the house if you surf or boogie board. There are no vehicles allowed on the beach in front of these houses. Kids and grownups love the Large 16x34 foot SWIMMING POOL, close proximity to the beach, (our own private path see the PHOTOS), the killer hot tub with ocean views, and the Dairy Queen for after dinner ice cream just a bike ride or skateboard or stroll up the street. 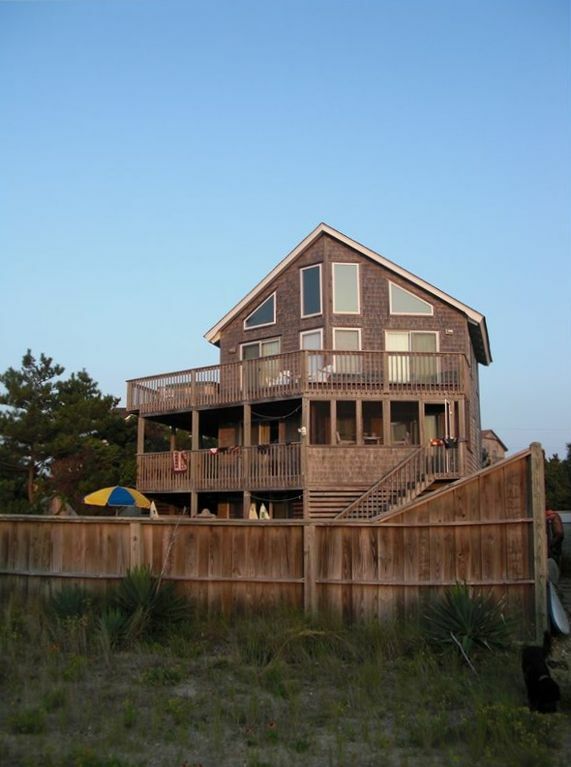 It is a comfortable Oceanfront house with nothing between you and the ocean except sand! The pool area is spacious and well lit at night for grilling and swimming after dark. 4 bedrooms ( plus 'pool room', which really is a 5th bedroom) and 3 baths with an outdoor shower. The water is clean and green and the ocean is fabulous right in front of the house. The owner's profile picture is of me and my surfboard and dog on the beach right in front of the house. National Seashore, turtles, manta rays.....surfing, sun bathing and boogy-boarding right in front of the house. This location is in Waves, NC, about a mile south of the Rodanthe pier on Hatteras Island. Just turn toward the Ocean off Hwy 12 at the Dairy Queen. The house borders directly on the beach. It is only a short walk over magnificent dunes to the water's edge. There is also a screened-in porch off the kitchen that looks out over the pool, a south facing third floor sundeck with a hot tub and epic views of the Atlantic, and a fireplace on the third floor for the cooler spring and fall nights. On the ground floor off the pool deck, the pool room has its own bath, a single bed, refrigerator, TV and a sleeper sofa. During the day this room is a play room and an exercise area with free weights and at night this can serve as a fifth bedroom, with its own bathroom and a nice view of the pool. The house features pillowtop mattresses and feather pillows so we can listen to the sound of the ocean from comfortable beds. (Have you ever vacationed and slept on a hard bed----Not here!) With the four bedrooms 12 beds and the pool room serving as a bedroom, the house can sleep a lot of people. There are excellent views of the ocean from just about anywhere on the second and third floors and loft, from inside or out on the decks. You can see the ocean while lounging in the hot tub! On the second level there is a large dining area and fully stocked kitchen, with views of the pool and ocean from inside or from the deck or screened in porch. The high cathedral ceiling on the third floor and large trapezoid windows combine to give a feeling of space to the top floor like a ski chalet. We watched a meteor shower once from inside the house just looking up through the high windows. Spectacular! For those of you who have been to Hatteras Island, you probably already know that it is the premier destination on the East Coast if you are into fishing, surfing, kitesurfing, windsurfing, beaching, catching rays, kite-flying, sitting by the pool, grilling, shelling, bonfires on the beach (yes it's legal) Or maybe you just want to sit and watch sports or a movie on the HDTV big screen( with a DVD player and VCR )while listening to and looking out over the ocean, or check your e-mail (yes we have wireless! ), or simply enjoying the sound of the ocean with a good book. We do all of these things and more in the comforts of a Oceanfront home with virtually all the amenities. Please call at first number below during the week or second number below on weekends if you have further questions. Pets are welcome if housebroken and on flea preventative treatment... A $500 damage and cleaning deposit will be required and returned in full if the home is left clean and undamaged. We also require a $275 charge for linen/towel service/cleaning. Crossing over the Bonner Bridge onto Hatteras Island you leave the other world behind. We hope your experience is as satisfying as it has been for us. Photo of owner and dog and favorite longboard. Great surfing and beach over the dune from the house. Fantastic views. Easy walk to beach. Big pool and hot tub. Comfortable beds. We love it. Big high ceilings. Easy bike ride to Dairy queen after dinner. Laid back island living. One of the biggest Pools you will find on the Island. The pool is not heated. The temperature of the pool will be determined by the ambient air temperature.